The Afro-Caribbean Garifuna people originated with the arrival of West African slaves who washed ashore on the Caribbean island of St. Vincent around 1635 while likely on their way to New World mines and plantations. Today, the global population of Garifunas stands at upwards of 300,000 people, many of whom live in the U.S. and Canada. Garifuna communities along the Caribbean Sea live mostly in coastal towns and villages in the Central American countries of Belize, Guatemala, Honduras and Nicaragua. For a time, the Afro-Caribbean Garifunas lived peacefully alongside French settlers who reached St. Vincent later in the 17th century, until being exiled by British troops in 1796 and eventually shipped off to Roatan, one of the Honduras Bay Islands in the Caribbean Sea. After successfully developing a healthy crop of cassava, a mainstay of traditional Garifuna diets, on Roatan, Garifunas branched out to the Caribbean mainland to establish fishing villages in Belize, Guatemala, Honduras and Nicaragua. According to one source, the Spanish agreed to transfer the Garifunas from Roatan to Trujillo, Colon on the coastal mainland of Honduras, effectively consolidating their claim on Roatan and the other Honduras Bay Islands and gaining better access to a workforce of Garifuna laborers. 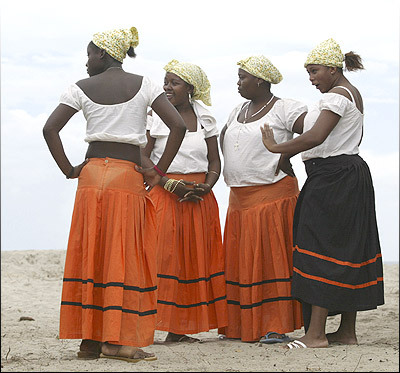 Afro-Caribbean Garifuna culture combines Caribbean fishing and farming traditions with a mixture of South American and African music, dance and spirituality. UNESCO declared Garifuna language, dance and music in Belize to be a “Masterpiece of the Oral and Intangible Heritage of Humanity” in 2001. Nicaragua’s President Enrique Bolanos hosted the First International Summit of Garifunas in Central America on Nicaragua’s Corn Island to ratify the 2003 UNESCO Convention for Safeguarding of the Intangible Cultural Heritage. President Bolanos’ objectives were reported to include joining Corn Island, located 350 km east of Managua in the Caribbean Sea, with other Garifuna enclaves in the Caribbean and establishing a trade agreement among Caribbean Garifuna communities from Cancun, Mexico on the Yucatan Peninsula to Nicaragua. Other aspects of the initiative included developing a partnership between Corn Island and Cancun and building a relationship with the Caribbean Community (CARICOM). 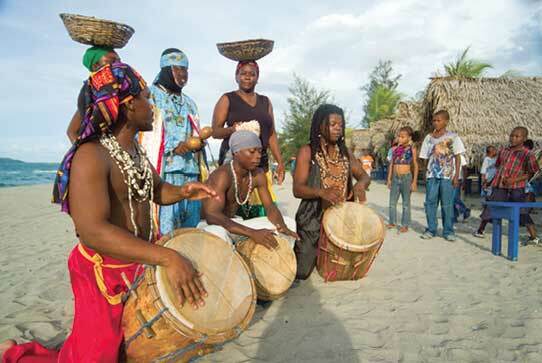 As the UNESCO recognition suggests, Garifuna culture is closely identified with music and dance. Garifuna music styles are known for their heavy use of percussion instruments and distinctive drumming, which combines the beats of primero (tenor) and segunda (bass) drums. Garifuna drums are typically made from hollowed-out hardwoods such as mahogany or mayflower that are native to Central America. Belize has given birth to a resurgence in Garifuna music in recent years, thanks to musicians like Andy Palacio, Mohobub Flores and Adrian Martinez. This contemporary take on more traditional Garifuna music styles has been described as a mixture of punta and paranda, another Garifuna music genre that was barely recorded until the 1990’s. Recommended examples of this modern style include the late Andy Palacio’s album Watina, which won the World Music Awards in 2007, and Umalali: The Garifuna Women’s Project, both released on the Belizean record label Stonetree Records. Ivan Duran of Stonetree Records was also instrumental in the initial recording of paranda through the Paranda Project. Many younger Garifunas have shown more interest in a popular, contemporary version of punta known as punta rock, a mix of traditional drumming, heavy bass, electric guitar, and enthusiastic lyrics. Garifuna food and drink make use of a combination of native Central American crops and African staples, including fish, chicken, cassava, bananas and plantains. Machuca, a dish of mashed green plantains with coconut milk soup and fried fish, is a common example of a traditional Garifuna dish. Dharasa, the Garifuna version of a tamale, is made from green bananas to taste either sweet or sour. Cassava bread is served with most meals. Other Garifuna breads include: buns, banana bread and pumpkin bread. A small group of Garifunas originally settled in Belize’s Stan Creek area around the present-day town of Dangriga to partake in fishing and farming. Dangriga, the largest town in southern Belize which also marks a kind of geographic and cultural dividing line between northern and southern Belize, can be considered the spiritual capital of Belize’s Garifuna people. Today, travelers to southern Belize can still experience native Garifuna drumming in some local restaurants and clubs around Dangriga and Hopkins, on Belize’s Caribbean coast, or, if they’re lucky, just listen to the Garifuna beats off in the distance while lounging under swaying palm fronds on the beach after nightfall. If you happen to find yourself in Hopkins, consider taking in a bit of the local Garifuna culture with a Belikin and a helping of Garifuna shrimp at King Cassava, a well-known local eatery and night club. Dangriga is also home to the Gulisi Garifuna Museum. Gulisi, a Garifuna heroine, founded the settlement of Punta in Belize’s Toledo District. The museum exhibits and documents the art, music, customs, spiritual beliefs and history of the Garinagu. 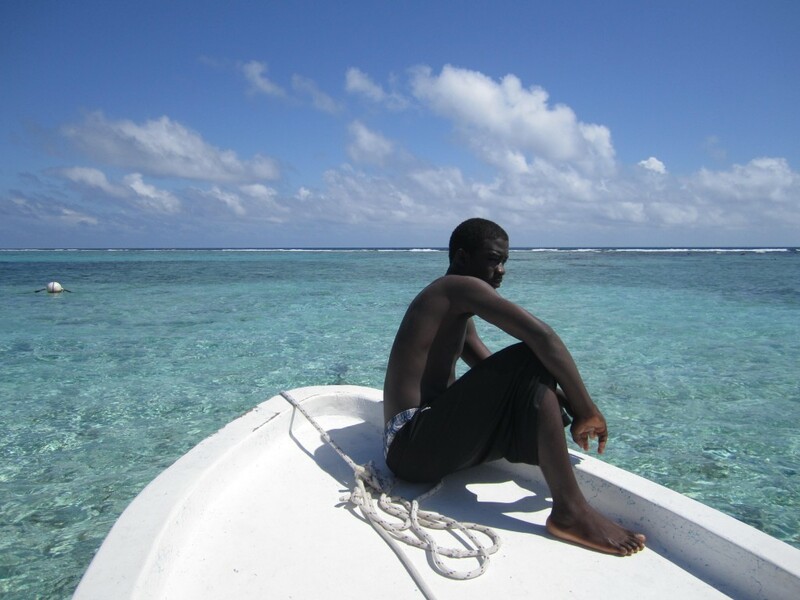 The picture below shows our resourceful Garifuna guide on a Hol Chan snorkeling trip from Caye Caulker, Belize. The small, remote town of Livingston on Guatemala’s Caribbean coast is the main home to the country’s population of Garifunas. Prior to the construction of Puerto Barrios, Livingston served as Guatemala’s main port on the Caribbean Sea. Surrounded by jungle and only reachable by boat, Livingston is better known these days as a place to experience Guatemala’s Garifuna culture and a travel destination for visitors in search of a native Caribbean vibe. Hardman, Jesse. Garifuna Ethnic Group Seeks Voice in New York City. NPR. November 15, 2009. Nicaragua and Region Ratify UNESCO Convention, But Garifunas Need More. November 17, 2005.